In 30 minutes, Cindy and I reached our southern turnaround point – Breach Inlet. To go further south would require swimming. And, I would not be swimming today. Instead we turned our cruisers around, and quickly appreciated the strength of the new-found tailwinds. Barely pedaling, we are scooting along and catching up on days gone by. When suddenly, Cindy spotted a starfish. I missed it. We were cruising too fast. A minute goes by and this time I spotted 2 starfish. Not alive of course, but washed up on the beach. What a lucky discovery, I thought. Suddenly my mind went into “art mode”, and I wondered if there was an art project I could create that might involve a starfish? There was no time to finish that thought, as we pressed on with our bicycles. We continue coasting along barely pedaling with a delightful tailwind. Out of a clear blue South Carolina beachfront bicycle cruise – the shoreline morphed into the red sea of death for starfish. Clumps with hundreds, soon to be thousands of dead starfish appeared along the waterline. It was quite unnerving actually. So much starfish death. It soon became impossible to navigate our bicycles without riding over hundreds of freshly passed on starfish. We eventually stopped to ask a few of the walkers if they knew what the starfish troubles might be — but no one had an answer. What causes all of these starfish to die – all at once? At this point I decided that Mother Nature wouldn’t mind if I picked up ONE starfish – for some unknown down-the-road art project. To be clear, the starfish washed to shore were not moving and could be considered “fresh beach-kill”. With much trepidation, I picked one up gingerly, and placed it carefully on my bicycle handlebars. I didn’t have a pocket or any way to transport my new friend, and quite frankly I wanted to keep an eye on it for a little while. What if it moved? What if it was still alive? What do I know about starfish anyway? Cindy and I continued to ride another 10 miles along the beach, passing by thousands and thousands of dead or dying washed up starfish. The numbers of dead starfish was unsettling, and at the same time I had my eye on “Bennie”. By now, I’ve named my starfish who was riding on my handlebars. I did my best to keep Bennie from falling off whenever I rode over a sandy bump. He didn’t appear to move – other than bounce a few times when the sandy beach got rough. We ended our beach portion of our bicycle ride at Wild Dunes, and turned into a seaside housing development. This is where I discovered little plastic bags for dog owners — that could easily be used to transport my friend Bennie for the remainder of my bicycle ride. Bennie now rests in the bottom of a dog-poo plastic bag, which is tied to my handlebars. 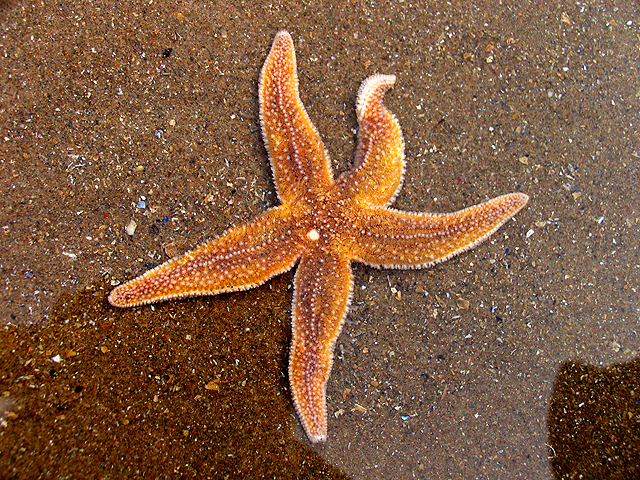 If I kept the starfish outdoors – then likely an animal will discover this treat. Maybe I need to store the starfish “inside”. What if my cat locates the starfish? I wonder if it will smell bad when it begins to dry out? Somehow I manage to keep Bennie from being consumed by outdoor animals, and my cat. Fast forward 4 days. Back in Maryland. Back at my home. I learned that a starfish does not decompose quickly. I had placed the starfish on a paper plate waiting for him to dry up. My husband confronted me that he had noticed a very bad smell near the refrigerator. Yep, that would be Bennie. So, I relocated Bennie outdoors in our sub-freezing temperatures inside of our BBQ grill. No, I was not planning to grill the starfish – but this location was perfect in that no other animals could get inside the BBQ. Two more days have passed, and I decide to check on my starfish. Uh oh. It is beginning to grow mold. After some quick Google research (“how to preserve a starfish“) it appears that it needs to sit in a bath of rubbing alcohol for 48 hours. We don’t have any rubbing alcohol, so I decide that some Clorox bleach would be a perfect substitute. After 2 days of bleach/water bathing, my starfish had shrunk to about 50% of it’s original size. It appears that the bleach is transforming the starfish into liquid form. So I quickly remove Bennie from the beach solution, and cover him with sea salt. At least he no longer smells bad. According to the Google – a sea salt rub will finish drying out the starfish – his last step to living on in his afterlife. An afterlife on my mosaic art project. To make sure that the sea salt did it’s trick, I left Bennie in this salt rub for about a week. By the time I looked back in on him – he was gone. That’s right — nowhere to be found. He has been transformed by this final act – a rub of sea salt — into nothing. Bennie apparently decided that an afterlife mounted on a mosaic – was not for him. As I look back at my time together with this little sea creature, who originally appeared on the South Carolina shoreline along with thousands of his relatives – it’s likely that I should have let him be. To be swallowed back up by the ocean. To be ground into sand. But then I wouldn’t have had the opportunity to appreciate my little friend – despite having botched his afterlife art project. My mosaic art project got created without Bennie. I substituted seashells for the starfish – and mixed Bennie’s sea-salt rub -into the grout. So technically, Bennie did make it into the mosaic. He’s just not identifiable as a starfish. But he makes for a great story – fused in his afterlife, into art.